This is one of the nymphs I collected doing something very, very strange on March 17th 2004. In the middle of the day, around 2 pm, in the water right around my feet I watched lots of Ephemerella nymphs clumsily swimming up all the way to the surface and then just kind of drifting and wiggling around in the water column. None hatched. They seemed to do it more intensely when the sun was out. It wasn't the time of day for the normal invertebrate drift phenomenon, and as far as I know invertebrate drift doesn't involve this kind of clear effort to swim all the way to the surface. I didn't need a net to catch them, I just reached down into the water and grabbed them with my fingers just below the surface. Tubercle: Various peculiar little bumps or projections on an insect. 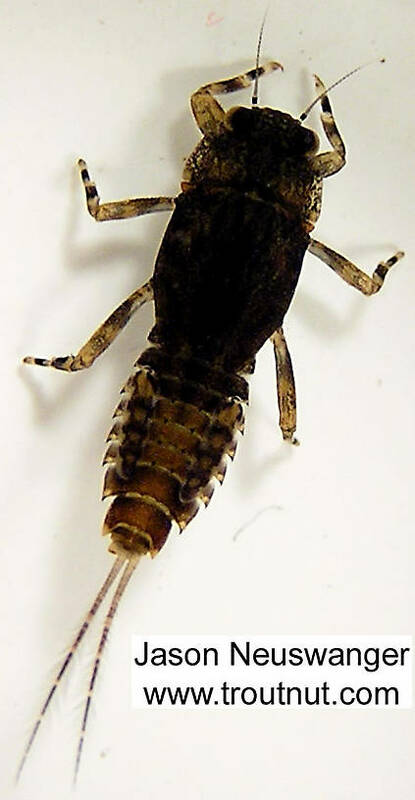 Their character is important for the identification of many kinds of insects, such as the nymphs of Ephemerellidae mayflies.) aren't quite black, though, and the general color is a dark brown, though I saw nymphs with all Hendrickson color stages behaving strangely. 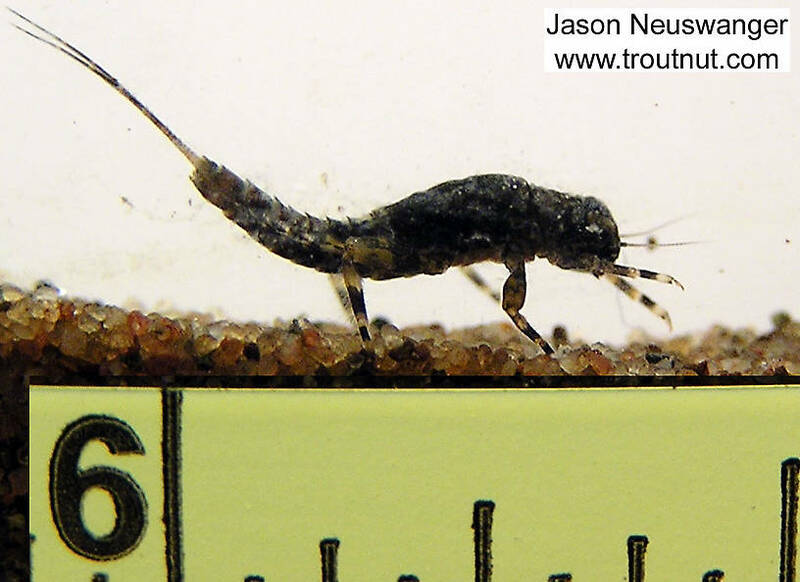 This mayfly was collected from the Namekagon River on March 17th, 2004 and added to Troutnut.com on January 25th, 2006.